I am very happy when I received this what’sapp text from one of my students, Juliana. What makes me even more happy for her is that the market is going down sharply yet she is making money and profits when almost everyone else is suffering losses. The effort and time spend on guiding my students take a load of my time. But when I see her text to me, I know it is all worth it. Why? Because I’ve made a difference in someone’s lives. Nothing is better than the sense fulfillment and accomplishment. I remembered when she joined me in around 2013-14 and struggled to grasp anything at all because she was totally new to investing and trading. Told me she was busy and couldn’t put in the effort and time due to taking care of her kids. I told her I’m here for the long haul and will be around when she is ready. After her first class with me, she comes back every single year just to re-attend my class. Not giving up and very determined. Last year when I finally see that she got my strategy and applying it correctly, I was amazing how good she was. For this, I salute you, Juliana, for the determination you have. Most people would have given up after trying a couple of years. Well, I think in this case its a lady. For those reading this, I have something for you. Because once you get trading right, trading stocks or forex or futures will be like brushing your teeth. Our discount coupon code has been fully taken up. We like to take this opportunity to thank everyone for their support. Please sign up for free for our newsletter for future updates from us, promotion and training videos on trading delivered to your email. Trade Alerts 2.0 is officially available for you to sign up. Just go to our main homepage to sign up from there. And for a limited time till 1st April only or limited to the first 60 sign ups only (whichever comes first), we are giving a coupon code where you get a big 40% discount and that’s a massive S$288 discount for a year of subscription. YES! You save a massive $288. This may not happen again so be quick to take this up. Here is the coupon code. “TRADEALERTS” Do take note that the coupon code will not be valid after 1st April 2018 or after first 60 sign ups from now. Take action now. I even give you a money back guarantee. Here is my money back guarantee to you. “If my trade alerts don’t post an overall profit at the end of 365 days, you get your full payment for my trade alerts 2.0 service back”. If my trade alerts cannot help you make profits, I don’t deserve your money. I am sure you’ll agree with this. Let’s be real here. In my previous posts, my trade alerts alone already has overall profits of over $600 in less than 3 months. And my trade alerts subscription fee per month is only $80. I would say that my trade alerts would have more than help you to cover the cost of subscription. See you on the inside in my subscribers area. 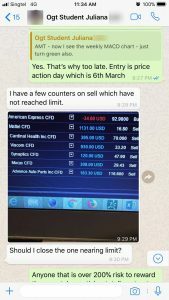 Apart from using a small account of US$7,000 to trade and send out my trade alerts, I also use my trade alerts’ signal details to trade my own personal accounts. I would say my trade alerts helped me to scale up my profits if I want to. Like I share in my earlier post through my screenshot of my trade alerts results, it’s already about 10% return on capital. Using a bigger account of around US$40,000, I am able to follow my trade alerts and scale my profits up. Below is the screen shot of my trades and results following my trade alerts’ signals. As you can see, the results are about 10% return on capital too. Just slightly over US$5,000. The trades are all done after I received my own trade alerts on my personal phone. “Yes”, I am consider a subscriber and member to my own trade alerts 2.0 service. So now you know I placed my Trade Alerts 2.0 service first before my own personal trading. I get in to trade my personal account only after I traded the trade alerts account and only after I send out the trades as trade alerts to members. If you are a member then you know that you’ll be trading your personal account about the same time I trade my personal account as we will be receiving the trade alerts’ signals about the same time.